The Gordon Horseshoe's carefully engineered design allows players of all skill levels and pitching styles to succeed in making solid ringers. The Gordon is indeed an all-round shoe, equally fit for family reunions as it is for championship tournaments! 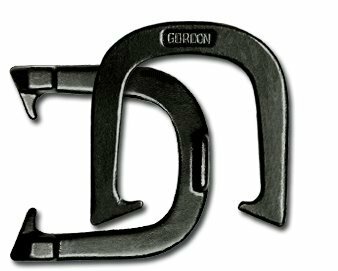 The Gordon is one of the most popular Horseshoes used in horseshoe leagues across America. Unlike common big box horseshoe sets made of cast iron or low quality steel (that often easily crack or break) Gordon Horseshoes are manufactured using the top quality Gold Standard Drop Forge process with premium AISI steel. Forging produces a unique internal grain structure that endows the exceptional strength and durability the Gordon is famous for (not the air pockets and internal voids common to cast horseshoes that cause breakage). A 1-year manufacturer warranty backs up the Gordon's High Quality manufacturing. When you are pitching Gordon Horseshoes you know you are pitching with top Quality. Now is the time to get your hands on a pair of Gordons and discover for yourself why enthusiasts from Backyard Warriors to World Horseshoe Pitching Champions have preferred them! If you have any questions about this product by Gordon Horseshoes, contact us by completing and submitting the form below. If you are looking for a specif part number, please include it with your message.